Do you have dormant spiritual gifts? We are into February now, usually Missouri’s coldest month with the greatest amount of snow and ice. Annuals’ seeds contain hormones that cause them to germinate in the warm spring weather that follows winter cold. Perennial plants, deciduous woody shrubs and some trees go dormant in the winter and begin growing again in the spring. Like some flowers, plants, and trees that go dormant, you may have spiritual gifts that are dormant. Gifts you’ve never used or don’t even know about. I believe our daughter Leah has some dormant gifts. This past Christmas, Leah suddenly told me that for her Christmas wish list, she wanted either an electric violin or a keyboard. She wanted to learn how to play them. This was nothing I suggested to her or ever talked to her about and, like Mary, I pondered these things in my heart. It’s interesting, because there is no one musical in our family. I believe this is just something that God put into Leah’s heart because He created her with a musical gift and He’s wanting her to use it. God has also put spiritual gifts inside of you. Do you know what they are? Are you using them – and using them to their fullest potential? Leah is an incredible artist and a very creative person so it shouldn’t surprise me that she might have a musical gift, too. Leah researched electric violins and keyboards, looked at positive and negative reviews on Amazon and YouTube, and then showed me which ones she would like. Leah also showed me a video of the incredibly talented Lindsey Stirling, a violinist who combines classical music with a modern twist, whom she had found on YouTube. I got goose bumps watching this video Crystallize. She is flat out anointed playing the violin! I was so excited about this and immediately began praying for God to provide the money for this gift and for God to help me find a violin instructor for her, knowing that I wouldn’t be able to teach her myself. I even asked God that if it were possible, for me to find a Christian instructor for her – but one who was really good as an instructor. 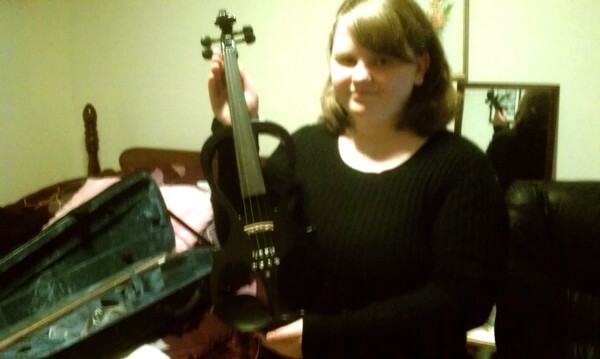 For Christmas, we bought Leah an electric violin! I don’t know who was more excited, her or me! 🙂 She thought from the shape of the package that she was getting a keyboard. She had the biggest smile opening her present. Don’t you know that is what God does when you open your presents from Him – your spiritual gifts? If Leah had never told me this is what she wanted to do, I would have never known about it and she wouldn’t have gotten the violin. God wants you to tell Him what you want. He wants to bless you with good things. Ask and you shall receive! One day I was having Mexican lunch with my friend Diane Bishop and at the end of the conversation, I asked her, “Do you happen to know of a good violin instructor?” I explained how Leah wanted an electric violin and we bought her one for Christmas. 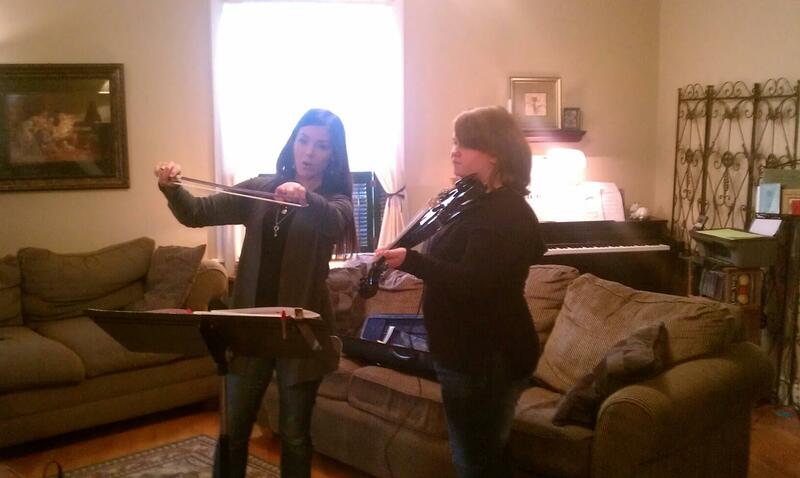 Diane then referred me to Emily, who was Diane’s stepdaughter Hannah’s violin instructor several years ago. She’s an anointed violin instructor and plays violin very well herself! I got her number from Hannah and called Emily and we set up Leah’s lessons right away. She is so sweet and I just love her and so does Leah. This was HUGE ANSWERED PRAYER! God is so amazing how He does these kinds of things! Leah has now had two violin lessons and is doing really well. She’s excited about the lessons and Emily is pumped about teaching her. Leah has never had any type of music lessons, so she is learning music theory (learning to read notes) as part of her lessons. We also bought her a small amp and a shoulder rest for the violin. It came with the nice black case, the bow, and the rosin, which is to grip the strings and make them sound. Without rosin, a violin (or other stringed instrument) won’t play. It causes the tiny scales on bow hairs to stand up and cause friction when dragged across the violin’s strings. It brings tears to my eyes and gives me so much joy hearing Leah practice on her violin each day. I’m sure this is how God feels about us, too, when we use the gifts He has given us-for HIS glory. To find out more about the spiritual gifts and how to use them, I recommend two excellent resources: Step Out and Take Your Place by Krista Dunk and Gifts and Ministries of the Holy Spirit by Lester Sumrall. You can also take spiritual gifts tests at your church or tests online. I also recommend the incredible movie August Rush, about an orphaned musical prodigy who uses his gift as a clue to find his birth parents.